You can read about days 0-9 here, and 10-19 here. The synopsis is, we are tired, want some solid ground and a good night’s sleep. Mother Nature is not cooperating. Day 20: After our overnight hove-to, we were about 15 NM N of where we had been – that is, the wrong direction from where we want to go. During the day we had our share of failures. The boom gooseneck cotter pin almost slipped out, but we rescued it in time. We discovered the outhaul failed, leaving the main sail clew attached with only a wire. Further debugging our failing solar controller doesn’t give many clues. We had a boarding wave enter the main cabin via an open hatch, making Van sad that the cabin was soaked. There was a sudden nasty squall during the day with 25 knot winds, gust 30”+ (which we did not find fun). And finally the weather charts don’t give us much hope for a smooth ride to Hilo. Peter tells us we must wait for Hurricane Darby to make landfall on the Big Island before we proceed to Hilo. All this was just too much to cope with, so Van and I decide to heave-to for the night again. All told, we added 23 nm to our remaining distance to Hilo, despite the log showing we travelled 74 miles this day. Day 21: Overnight, the winds abated, the seas calmed some and we had a great sleep, which was much needed. The new day brought the ability for all of us to see the wisdom of Peter telling us to let Tropical Storms Celia and Darby slide below us before we made for Hilo. Even Eric agreed after I charted both storm’s paths versus our potential course. So we took it easy this day. I made popcorn and Van opened the pistachios. Eric had some wine. Easy sailing day. Log showed we travelled 69 miles, but in reality we added 13 NM to our journey to Hilo. Decided to heave-to overnight again with goal of letting the storms have time to slip past us. Day 22: Overnight hove-to was rough and uncomfortable. Eric awoke about dawn when a too-nearby fisherman shown his spotlight at us. Over the VHF radio, we heard a thick accent say, “You need any help?” We learned he was about 1/4 mile away and had out 1-2 miles of net. We started the motor to get the heck out of his way. Later, we looked at the weather charts to see that the distant storm Darby was predicted to trend south of the Big Island later in the week (good news as we are north of the island), but the preceding storm Celia was going to give us grief if we started heading south from our position too soon. We decided no matter what Peter said, we were going to hang out for another day – but when Peter wrote and told us to gibe and “head for the barn, ” we did just that. Silly. In the early evening found ourselves getting into the gale-force nastiness preceding Celia (which of course was all predicted by the weather chart). We decided to heave-to while making dinner, and as conditioned worsened, stayed hove-to overnight again – first on a port tack to head north, and then flipping to starboard tack to head south again (and with difficulty, adding many more wraps on the jib to try to improve the ride). Log says we travelled 74 miles this day, with 29 miles towards Hilo, which was better than the previous 2 days where we added distance to our journey. Here is the graphic that shows our situation- day 22 is July 17th. The red line is our track, with our position on a given July date (that is, the date in July, not the number of days we’ve been at sea). Tropical Storm Celia’s path is the next line, and TS Darby is the bottom line. For example, on the 16th of July, we are hanging out around 30N to avoid Celia that is slipping below us between the 16-18th. Darby is yet to arrive within this view, but we know she is coming. 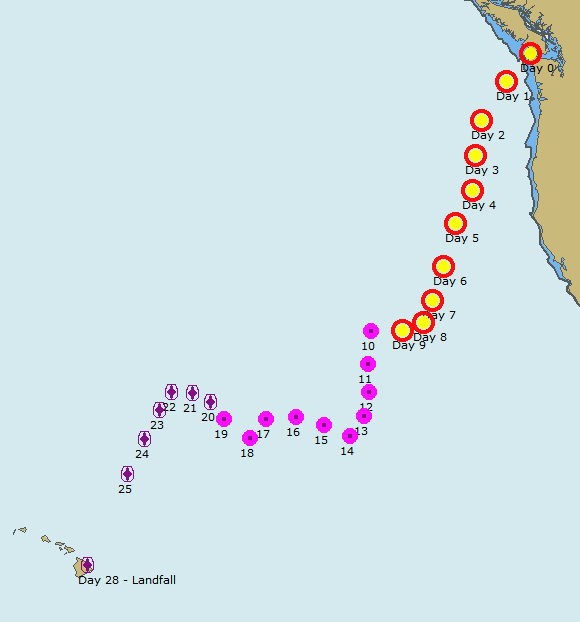 We make the turn for Hilo on the 17th while Celia is passing below us, and then “make a run for the barn” to beat Darby to the island by July 23rd. But I am ahead of myself again. That run for the barn is described next. Day 23 (July 18th): After a tough night, and the disappointed of our failed ‘run for the barn” yesterday, we hesitantly set course for Hilo. As the weather improved, so did our commitment to make a run for it. We unfurled two more wraps from the jib, and at times are sailing at 6.5 knots. We rode out a squall with gusts to 40 knots while playing the mainsheet to manage the wind shifts. Our desire to make for home has boosted our confidence. Van ate a lime because he said “he needed some excitement.” I guess 10 foot swells and 40 knot winds aren’t enough any more. The log says we traveled 77 miles this day, with 68 miles toward Hilo. Hurrah! Day 24 (July 19th): Very rough seas overnight – Van wouldn’t let me take my night shift because he said it was too rough for me to be up and about. He had a point. I got pitched while brushing my teeth, despite being wedged in place. I hit the basin hard, but it only left a nasty bruise on my hip and a more keen awareness of how fast and violently the boat can pitch. Eric said one swell was so steep, it put the rail in the water. Wow. Once dawn came, we unfurled the jib and shook out the main reefs. Wind is in the 18-22 knot range, with occasional squalls and rough seas. We are averaging better than 6 knots on a course straight for Hilo. Log says we traveled 120 NM. Day 25 (July 20th): More problems overnight. Now the weather charts shows Darby heading north of the island, right into our path. Clearly this is a tough call, but we’re desperate to make landfall, so we keep going with the hopes we can beat the storm to the island. When I start my 0400 shift, I notice the fridge isn’t running, and then discover it is because our 12 volt house battery bank is at only 9 volts. YIKES! This is very bad. In desperation, we start the engine (with the dedicated starter battery) with hopes the alternator can recharge the house batteries. At first, the alternator cannot get the required excitation voltage to start, but as Van started flipping breakers, it kicked in. Huge relief as the house batteries start to recharge – we need them for navigation instruments. With the engine running, we start charging all critical handheld devices and making copious notes about anything that might help us make landfall without the benefit of instruments and GPS to know our position. Ugh! Fortunately, the batteries could hold a charge, and we do have instruments for the remainder of our voyage. (What a relief that was, sorry for the spoiler.) The afternoon brought clear skies and decent variable wind. I steered much of the afternoon to make a more direct course towards Hilo – the Monitor wind vane is tired too and not up to the task. We traveled 142 miles this day, all towards Hilo. We have about 375 miles to go. Day 26 (July 21st): I woke up about 0300 because I could tell the seas were horrible – and learned from Van that the Monitor windvane control lines parted. Van decided to go on the aft deck to fix the lines – it took about an hour while I hand-steered, but he got the job done. Van is amazing. Day break was pretty, but the seas were a mess. To make best progress towards Hilo, we eventually end up sailing dead down wind under “jib and jigger” and then eventually under jib alone as the mizzen (AKA jigger) adds too much weather helm. We have around 200 miles to go to Hilo. Day 27 (July 22nd): Sailing overnight with just the jib meant we followed the rhumb line, but we went slowly. We need to get moving if we are going to beat Darby to the island, but Darby is stealing our wind making sailing challenging. After much discussion about the best sail plan to achieve our desired course, we decided to give up on sailing and start the engine to go as fast as we can directly towards Hilo. At times there is almost no wind. At other times, we see sustained 30 knots with gusts to 37, but we are too tired to play the winds and just keep motoring. This was the most tense time of the passage for me – we had little recourse if something went wrong with the engine. We were in a race with a tropical storm (on it’s most angry side at that) and we would not win if the engine quit. But Mr. Perkins performed admirably for the last 10 hours of our journey. Day 28 (July 23rd): We did it. We passed the Hilo breakwater before dawn about 0500 local time. Tropical Storm Darby was already battering the coast south of us, though it didn’t make landfall for about another 10 hours. 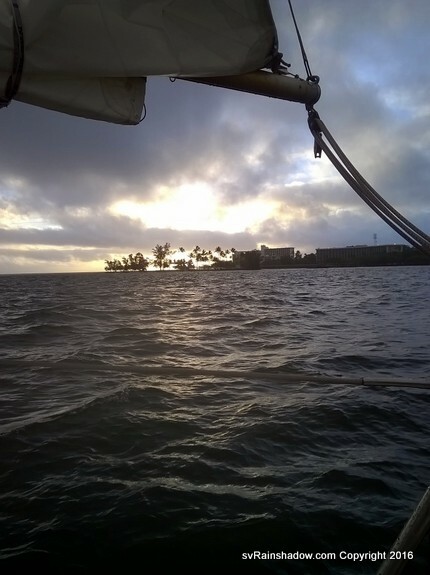 We anchored in Hilo Bay and breathed a sigh of relief. Eric was desperate for land (and to get away from us) and set off rowing to shore in the dinghy. Peter swam out to help Eric row in. Christy braved the storm to come into Hilo to drive Eric home – all this drama is worth a post on its own, but I it’s best to just leave it to our memories. Van and I stay aboard with Peter on watch while Darby does her business in the Hilo Bay. Peter observed sustained 25 knots with gusts to 30 while we rode on the anchor – and Van and I slept soundly through it all. After that few hours of sound sleep, I was giddy with delight. We had done it – Rainshadow brought us safely to Hilo. So – after a total of almost 29 days at sea, the log says we traveled 3411 nm to do this 2550 nm passage. Rainshadow needs repair work, and we all need time to recover and assimilate what we just experienced. During our passage, there was no pause button when it was overwhelming and we needed a rest – the ocean was completely indifferent to our well-being. It was a good experience. With time, we all developed our own versions of this passage story. The version told in these posts come from the GPS tracks and the captain’s log. And yes, we all still get along very well. Here’s the view from our boat after setting anchor in Hilo Bay once dawn arrived.